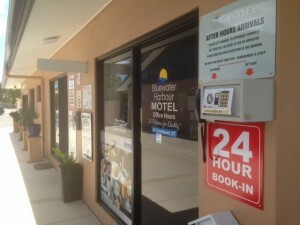 As we all know not everyones schedules allow them to be on time, at the Bluewater Harbour Motel we have a 24hr Book-In service that allows for our clients to get there keys for thier room without any hastle at all. Below are the list of points that you will have to follow. Pick up the Handset located next to the front Reception door. The friendly staff on the other end will confirm who you are. You will recieve a code for the Key safe. Put in the correct code. Turn the handle (CLOCKWISE) the latch is quite firm so you will have to turn it firmly. Retrieve your Key (Your name and room number will be on the envelope). Have a great night sleep and we will see you in the Morning for Breakfast.